This is a quick, simple recipe that's bursting with flavour. Serve with fluffy rice and garnish with finely chopped chillies for an easy, delicious dinner. Skin the fish and then chop it into rough 3cm cubes. Mix together the corn-flour, chilli powder, turmeric and salt. 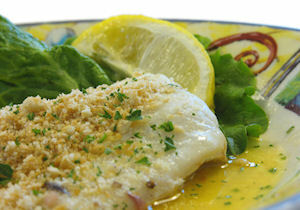 Toss the haddock fillets into the mixture and pat them to get rid of any excess. Heat the olive oil in a frying pan and fry the fish pieces for 1 minute on each side.